This is the quilt front. 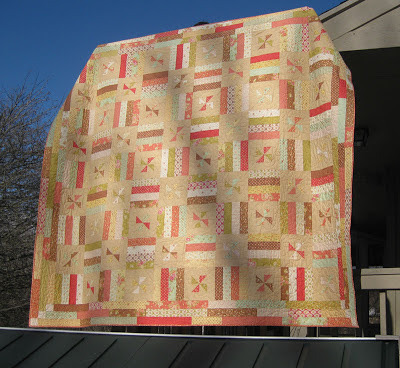 The quilt is made from the pattern "Summer Breeze" from the book "Scrap-Basket Surprises". 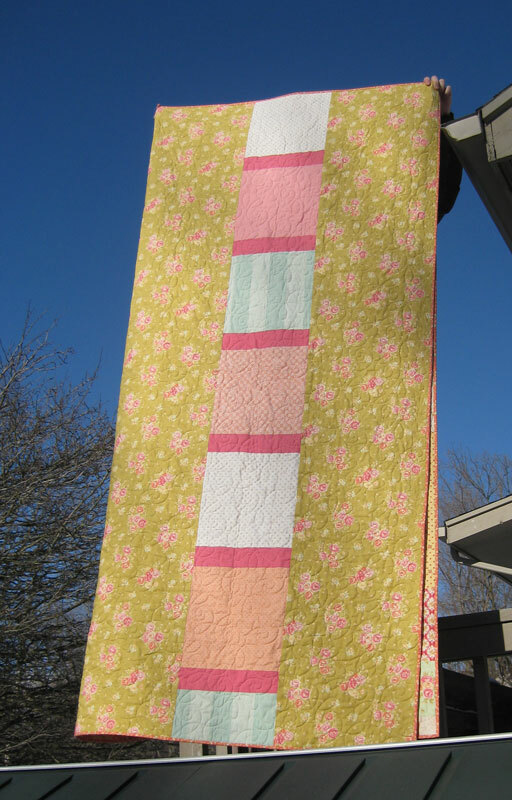 I did add more blocks to my quilt to make it bigger. It is probably queen size. This is my first real quilt and it was made for my parents-in-law. I made a quilt when I was in high school that was much smaller and a disaster, so I don't really count it. This is the back. I like more contemporary quilts so I had some fun back here. This closeup of the back allows you to see some of the quilting stitch pattern. 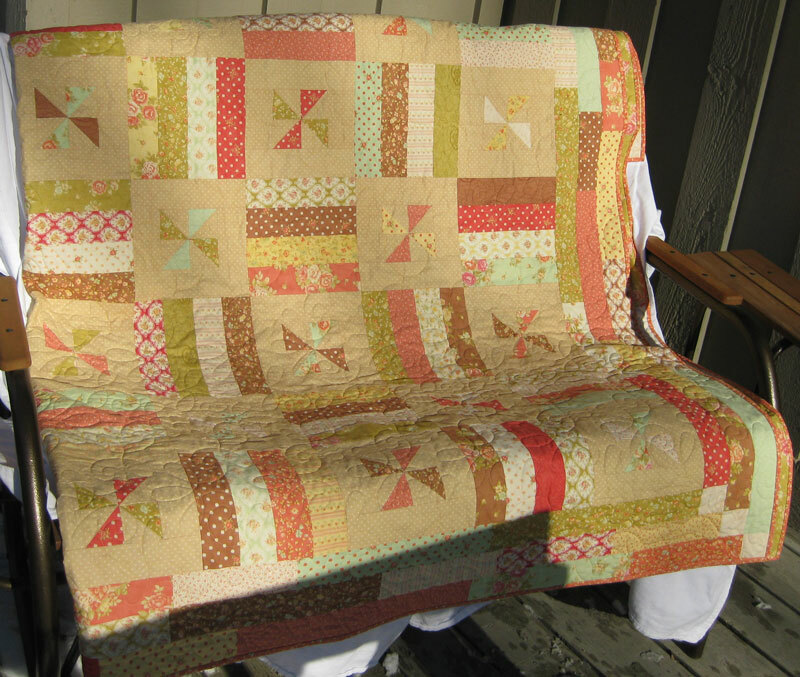 I had it professionally quilted. 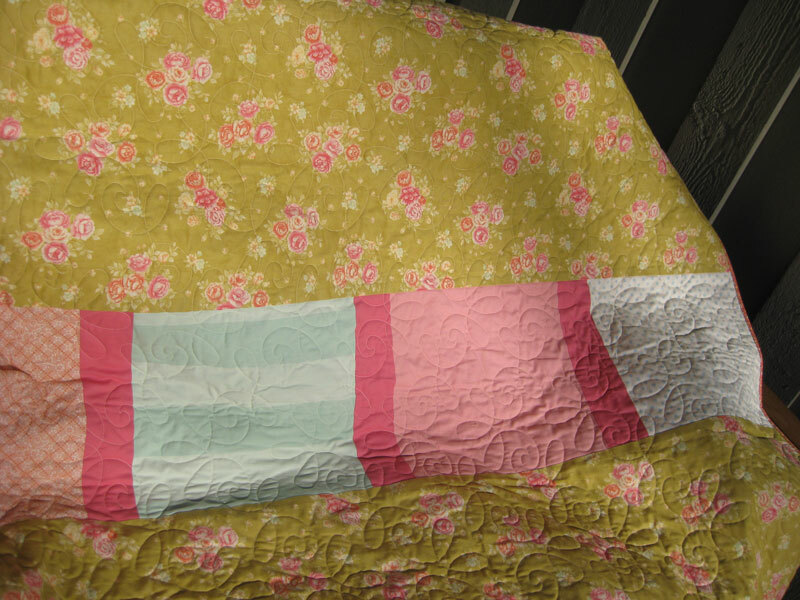 There was no way I was going to try and quilt my "first" quilt on my sewing machine. I sure hope they love it! Our friend's Mother In Law is visiting from Italy so we thought we'd make her a small gift. 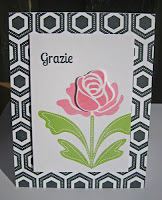 She does not speak English, so I made sure to use my Italian Language stamps from PTI. 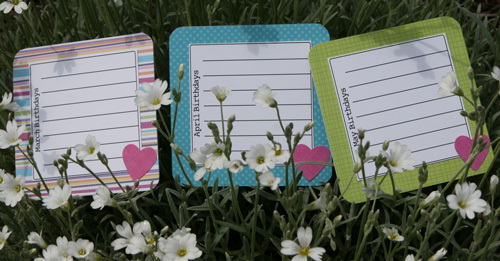 Wow, those were really handy to have on hand and they are only $5! 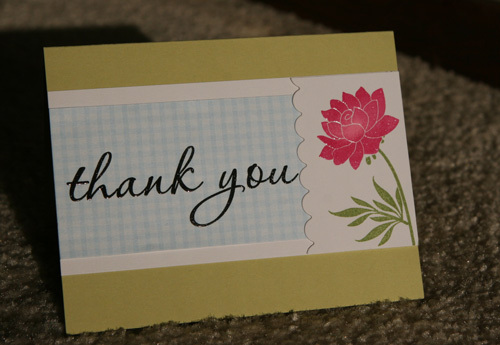 I originally bought them to make my friend a set of thank you notes. Anyhow, on to the design. 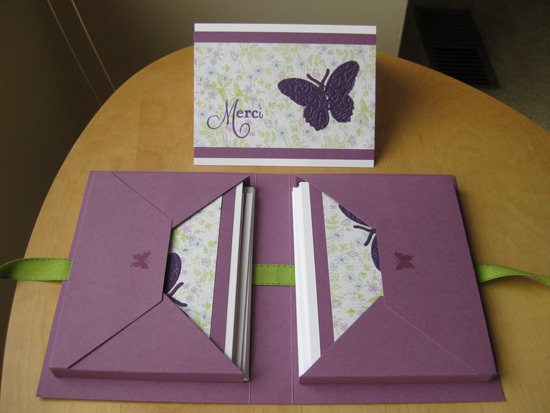 I was heavily inspired (and practically copied) these gorgeous cards by Maile Belles from the PTI design team. All the stamps (except for Italian words) came from PTI's Rosie Posie stamp set. The hexagons come in a strip that has 5 hexagons. My only huge gripe is that on every other row, you need to stamp offset from the previous and you are one hexagon short on a 4.25" wide card. So then you have to ink up on hex on the strip and try and line it up to complete your row. I really wish they had put SIX hexagons on that stamp strip. Would have saved SO much time. 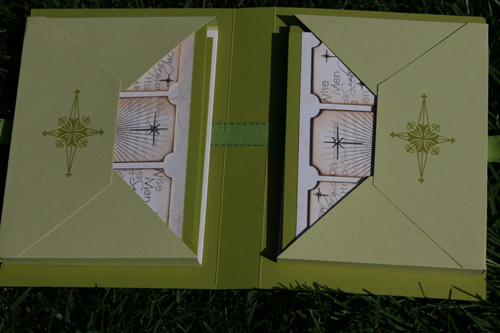 The outer and inner hexes are stamped separately. 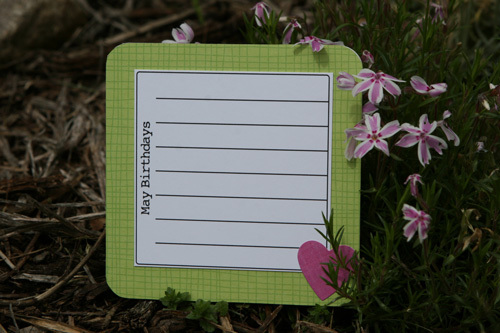 So this is a pretty time consuming card. Fortunately, my husband is a great helper. He will pop the ink cover on and off and hold things and place, and whatever I need. He is the best, plus it also makes the gift from BOTH of us! 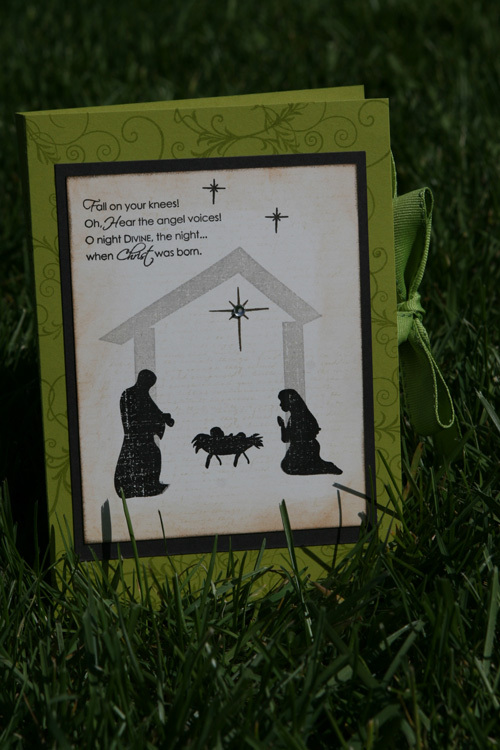 =) Here are some more cards in the set (each one we made different). I've been in the sewing room non-stop lately trying to get through my very long list of Holiday Gifts. 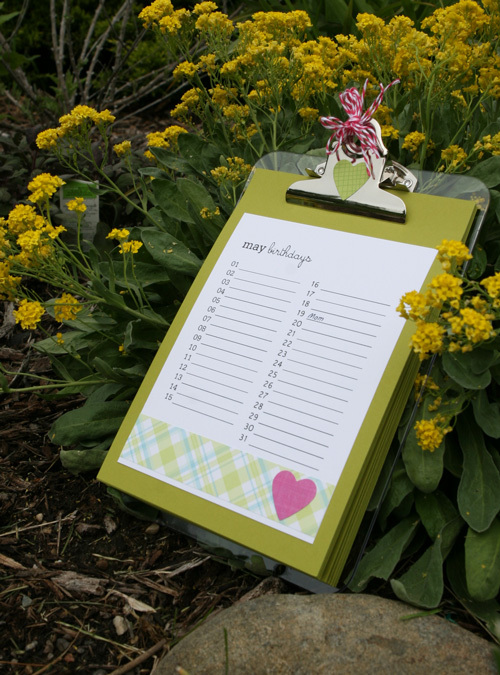 I even have my list prioritized --making gifts that need to be shipped first. 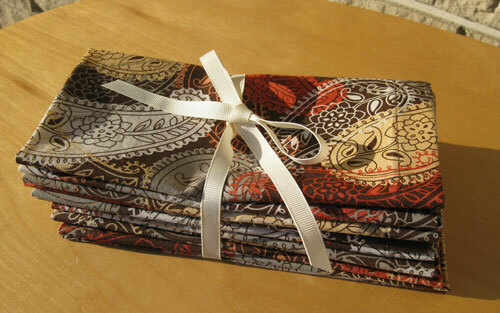 Here is one of my completed projects, a set of 8 dinner napkins with mitered corners. Fabric is from Art Gallery Fabrics in a paisley print from the Gipsy Glitter collection. I made this for my Sister-in-law who just graduated college. 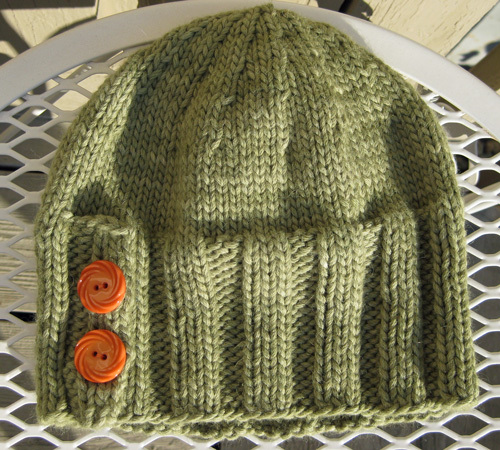 I knit this from Blue Sky Alpaca's Two Button Hat Set. The yarn is also theirs. It is their Worsted Hand Dyes in "green". I have a good friend who I made these napkins for as a Birthday gift. One of her many languages is French so I chose French themed fabric. They turned out SOOO beautiful. I wanted to keep them for myself! I made a set of 8. 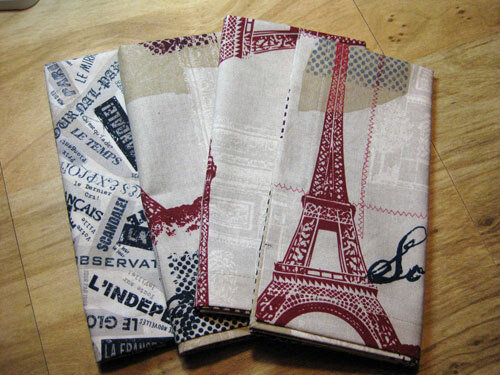 Five Eiffel Tower, and 3 French newsprint. 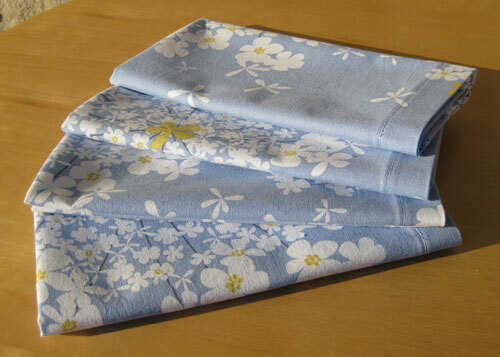 All napkins had these amazing (if I do say so myself) mitered corners that I recently learned how to do. This is a card I made for Father's Day this year. 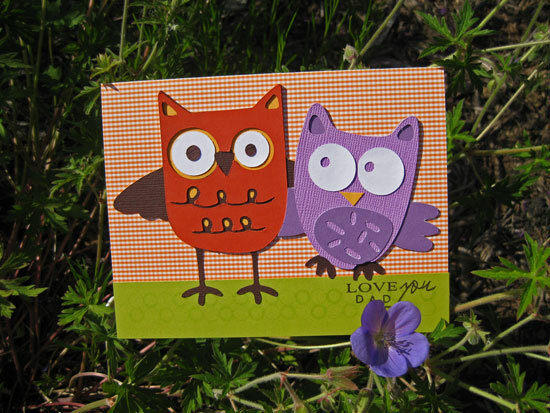 The Owl's are from the Cricut Lite Cartridge "Hoot 'n Hollar". 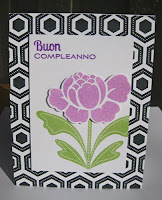 Circle background and sentiment stamps are PTI. 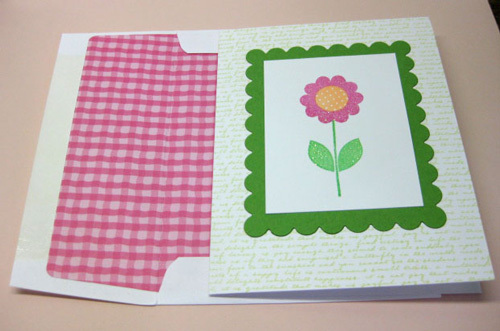 Cute gingham paper is from Amuse Studio. 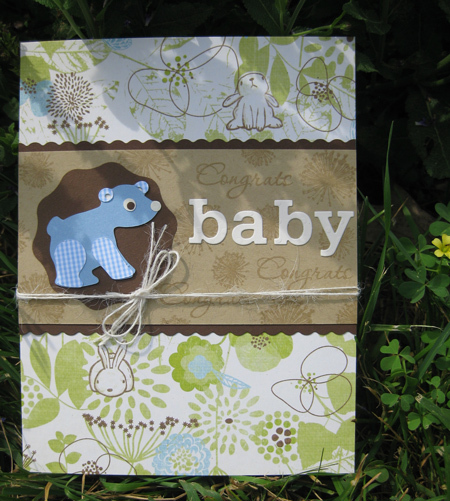 A friend asked me to make a baby card for her and this is what I came up with. 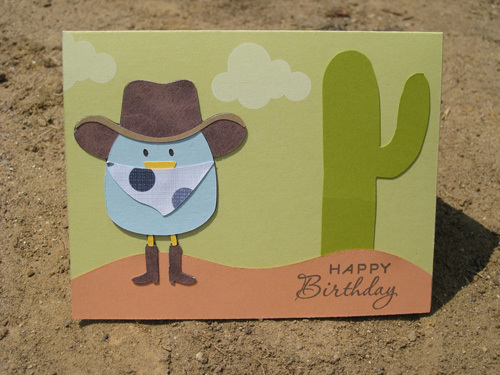 My Dad lives in the southwest so I thought this would be a great Birthday card for him. I used the 3 Birds on Parade Cricut cartridge to make the cowboy bird. I cut the cactus by hand after sketching one. 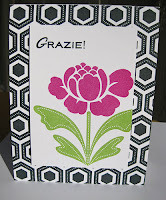 I used my Papertrey Ink Meadow die to cut the dirt. I stamped the clouds with white ink. 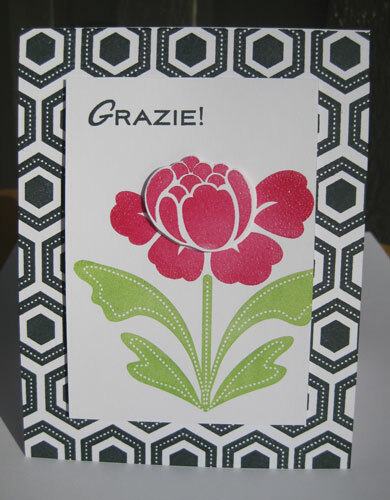 I used my zippers die from Papertrey Ink. Hidden behind that panel is a gift card. 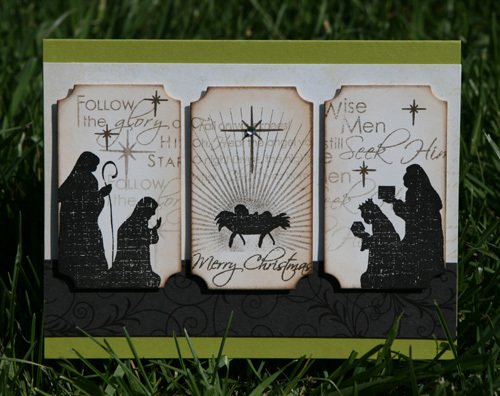 He will need to pull the tab to open it and get the card. I thought it made the card more fun and interactive. 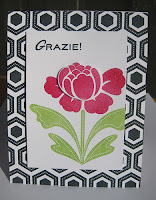 I used my new Daydreamer stamp set from Papertrey Ink to create this floral thank you card. The partial postage stamp came about as an accident. 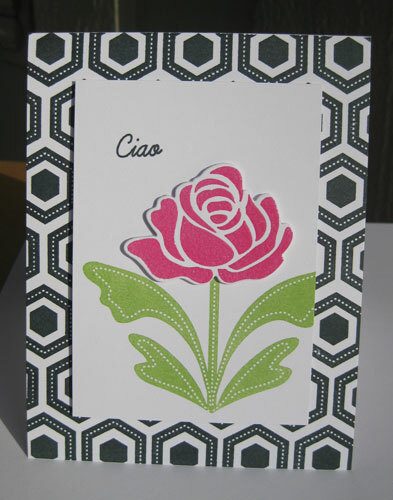 I was trying to stamp two flowers in a scalloped rectangle but I didn't like how it looked so used my paper trimmer to cut one out and thus ended up with what you see here. It was a happy accident I suppose. 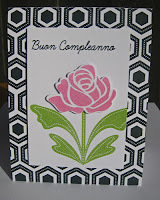 =) I first inked the flowers with Pink, and then dabbed the stamp edges on the Razzberry pink to get the two-toned look. 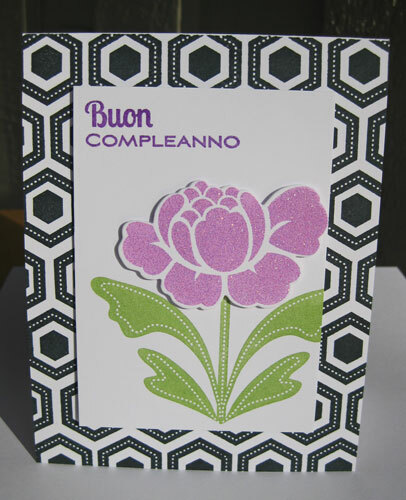 PTI cardstock in Spring Moss& Stampers Select White. Not sure where the blue is from. 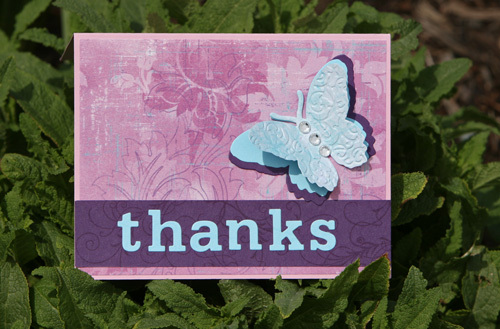 Stamps: PTI Daydreamer and one of the Think Big Favorites that contains "Thank You". Ink: Colorbox Pigment in Razzberry, Pink, and Black. Memento Dye ink in Bamboo Leaves. 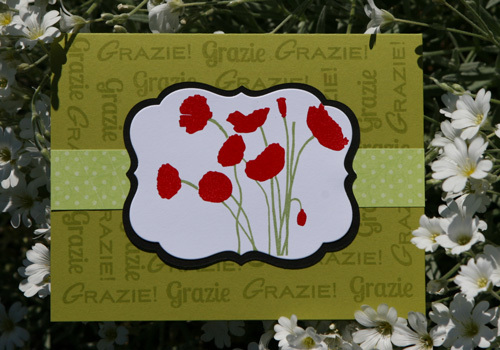 Other: Clear embossing powder for flower and thank you. 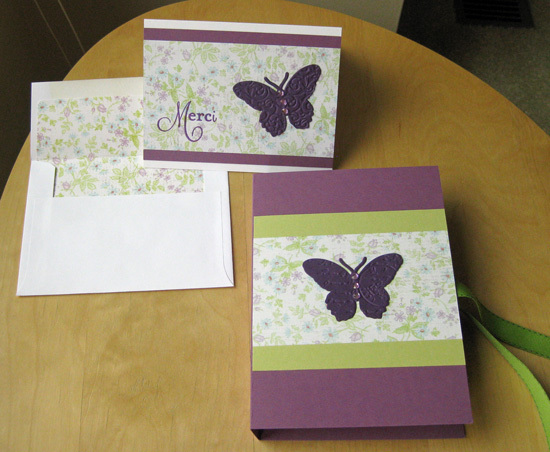 I made this card for one of my Aunts. 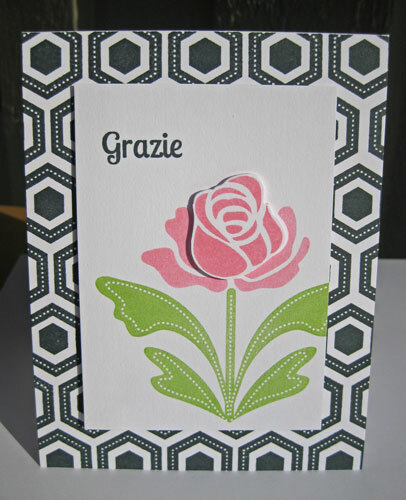 I got as far as the flower framed by the green scallops...then I couldn't find a colored card color it looked good with. Putting it on pink was just too much and white was too plain. 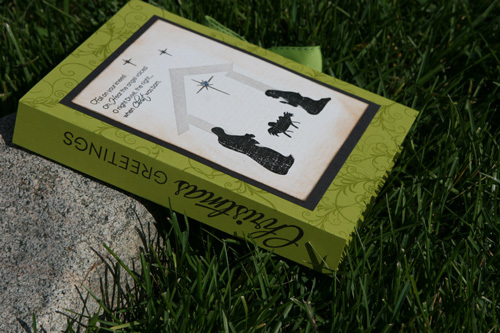 I finally decided to stamp cursive text in a lighter green on a white card. I really like how it turned out! 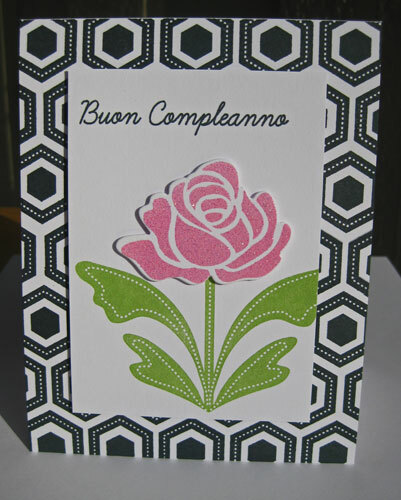 Ink: ColorBox Pigment ink in Razzberryand Fresh Green for flower. Memento Dye Ink in New Sprout for script text. 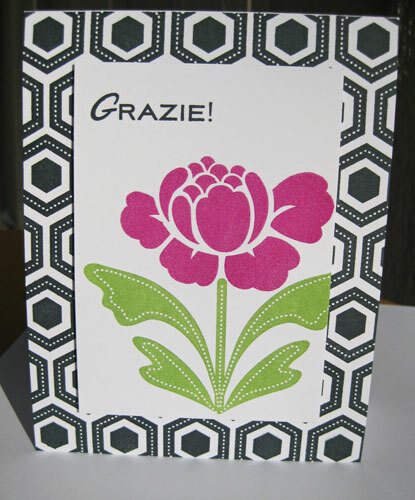 Paper: Papertrey Ink: Stampers Select White, New Leaf for card. Envelope Liner is some pink paper from JoAnns.